Orson Welles' 1974 F for Fake is a supreme example of a cinematic sleight of hand, a magic trick deftly executed by a consummate showman, one that misdirects the eye and on the first viewing leaves you unsure whether you've been hit by an information overload or been tricked into believing you have. 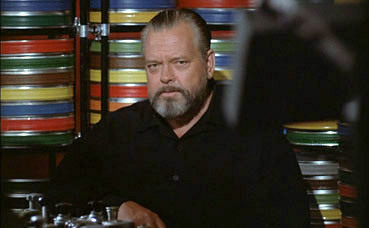 Such uncertainty is largely the result of Welles' own game-playing with the film form, his non-linear storytelling and Three Card Monte editing that delivers a fast-flowing stream of the factual and the fanciful, on the way throwing up a wealth of debate points about the art, authorship and the nature of truth. 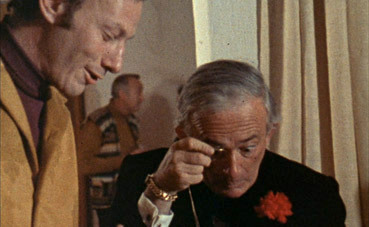 F for Fake is, true to its title, a film about lies and fakery and two of its more notorious practitioners, Elmyr de Hory and Clifford Irving. As with so much in the film, the two are inextricably linked. Elmyr was one of the art world's most successful forgers and Irving his biographer, although Irving himself was later exposed as the forger of an autobiography of Howard Hughes. But this is just the kicking off point for Welles and his "new kind of film." He quickly establishes himself up as a central character in his own story, a self-proclaimed charlatan and constantly amused host who regales colleagues in restaurants and swaps forged signatures with Emir on their respective artworks. Later he recalls his own claim to widespread notoriety as a master deceiver with his 1938 radio broadcast that presented H.G. Wells' War of the Worlds as a factual news report, one that sent half of America scurrying for the hills. This mischievous fakery continued with his celebrated first film, the lead character of which was based so accurately on newspaper tycoon William Randolph Hearst that newsreel shots of Hearst Castle in San Simeon look today like Citizen Kane outtakes. He teases us with suggestions that ludicrously wealthy Howard Hughes was the originally intended target, but are we being educated or hoodwinked here? Is this just a ruse to provide Welles with a segue to a section on the life of a man he was clearly fascinated by? But there's more. 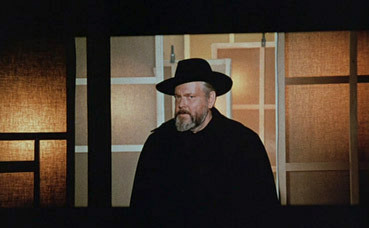 Much of F for Fake wasn't shot by Welles at all but by filmmaker François Reichenbach for a television documentary on Elmyr, something Welles acknowledges from the start in a playful opening sequence on a station platform, where he waves to Reichenbach and his film crew, exchanges words with his beautiful girlfriend Oja Kodar and performs conjuring tricks for entranced children, before being transformed in two zooms and an edit to a studio interior, neatly reminding us that film, even documentary film, is essentially an illusion of reality. So much of F for Fake is multi-layered that you need at least three viewings to begin unpicking the complexities and separating the truth from the fiction. This almost invisible marriage of opposites extends to the technique, right down to the seemingly decorative, with the story of Welles' War of the Worlds broadcast accompanied by extracts from the 1956 Earth Vs. the Flying Saucers, an alien invasion film whose special effects were created by the great Ray Harryhausen, fake flying saucers in a fictional story used to illustrate a true tale of another fiction that was sold to the public as fact. And this is just one small example from very many. Welles leads us on a breathless cinematic quickstep through lives and work constructed around false images of truth, and in the process admits an admiration for Elmyr and the skill and the scale of his fakery. It's hard not to agree – after all, if quality and value are measured solely by opinion, as they are in all of the arts, then where do you look for absolute truth? More to the point, can it actually exist in art at all in objective terms? It's no use scanning the following paragraph for an answer as I don't have one, and anyone who claims to do so is living inside an ego bubble that I urge you to burst with whatever tool comes to hand. Just take a trip around the IMDb and look at the user comments on almost any film you care to name and you'll encounter a wide diversity of opinion. So which one is right? Which represents the real 'truth'? Why the one that most closely mirrors your view of course. Opinion is the currency of art appreciation and criticism and an artwork only acquires financial value when the opinion of self-styled 'experts' and those with the money to outbid each other for it finds widespread concensus. That Welles' own work had at this point in his career been repeatedly undervalued by those who trade in opinion was doubtless a contributory factor to the wry amusement he displays here, and your take on his intentions could well be shaped in part by your own attitude to art and its value. So is Welles being playfully serious or seriously playful? Is he sharing a joke or playing one on us, or both? Does it actually matter? Hell no. Welles once stated that filmmaking was "The biggest electric train set a boy ever had," as neat an encapsulation of the fun that participating in the process can be when you're working with the right people on the right project. More than almost any other film he made, F for Fake seems to epitomise that sentiment – this is Welles having the best of fun with his train set, right down to the tale's amusing final twist. Part documentary, part essay film, part self portrait and part cinematic prank of the highest order, F for Fake is a kaleidoscopic, dazzlingly edited one-of-a-kind that drives a bullet train through documentary film conventions, and is one of those rare films that is as enjoyable, memorable and (crucially) meaningful for its technique as for its content. Framed 1.66:1 and anamorphically enhanced, this appears to be another of Masters of Cinema's licences of Criterion transfers, although this one is a PAL disc sourced from Criterion's high definition master. F for Fake presents a challenge to any attempt at a pristine transfer due to its mix of (then) newly shot 35mm sequences with material from a number of other sources, including Reichenbach's 16mm footage. Some of this appears to have been cropped a little at the top and bottom to fit the 1.66:1 framing, but that would have been by Welles himself – the framing on the 35mm work done by regular Welles collaborator Gary Graver looks fine. The quality of the image also varies according to the stock used, with the 35mm having superior sharpness, colour and contrast to the older 16mm and at times is very impressive. Film grain is very evident on all of the 16mm shots and there is more dust and dirt here, although this was very likely carried over in the original transfer to 35mm. On the whole this is probably as good a job as you could hope for, given the original material. The mono 2.0 soundtrack is clear and free of fluff and major distortion, although the dynamic range is inevitably limited and the music doesn't have the punch of a more modern film. In a couple of shots there appear to be minor sync issues, suggesting perhaps a little post-dubbing work on Orson's part, perhaps. Otherwise, no problems. The film's cinematographer and the US correspondent of Cahiers du cinéma take us through the film, with Krohn enthusing over Welles' editing and, together with an unnamed other, prompting Graver for his memories of the shoot and working with Orson. Graver usefully settles some points of speculation, some to Krohn's considerable surprise, as well as providing choice background on some of the technical aspects of the shoot and his own history as a cameraman. It's all interesting and sometimes revealing stuff with a poignant end – Graver asks to stop because he is getting tired, and a few months later died of complications from cancer. The DVD is dedicated to his memory. A visually straightforward but interesting and enthusiastic address to camera by author and critic for the Chicago Reader Jonathan Rosenbaum. There are a couple of brief crossovers with the commentary, but otherwise this is a good companion piece that never gets overly analytical. He talks a lot about Welles and his career, and shares with Krohn a particular enthusiasm for Welles' 9 minute trailer for the film. I was originally disappointed that this trailer was not included as an extra feature, but the day after my original review was posted I received an email suggesting I look a little harder. Another very fine booklet that's well up to the usual Masters of Cinema standard. Included is a substantial essay on the film by Welles author Joseph McBride, a piece on Chartres Cathedral by Fred Camper (see the film to get the relevance), an interview with one of the film's editors, Bill Haugse (later nominated for an Academy Award for his work on Hoop Dreams), and an essay loaded with questions by Craig Keller. And there I was complaining about its non-inclusion and all the while I had simply failed to fully enter the spirit of things and go looking for it. Welles' much admired but never screened in theatres trailer is an extraordinary work in its own right. Presented by DoP Gary Graver and deliriously edited, this clearly gave Welles almost as much fun as the main feature and no doubt had distributors holding their heads in their hands. To access the trailer, select the Commentary from the main menu. On the Commentary page click the 'up' button on your remote twice and a large question mark will appear in the bottom right of the screen. Press 'select' and the trailer will run. One of Welles' most enjoyable and playful films, F for Fake is also one of his most densely packed and multi-layered, something you only really appreciate with multiple viewings. Masters of Cinema's DVD benefits from a very decent transfer, a consistently informative commentary, the enthusiastic Jonathan Rosenbaum and typical fine booklet, but still loses out to the Criterion 2-disc set, which also has a commentary (with Gary Gravers and Oja Kodar), an 88 minute documentary on Welles' unfinished projects, a 52 minute documentary on Elmyr de Hory, a 60 Minutes interview with Clifford Irving about his Howard Hughes autobiography hoax, a 1972 press conference at which the hoax was exposed and, yes, that much talked about 9 minute trailer. But if you're not worried about those extra supplements and don't want to cough up for the Criterion price, then the Masters of Cinema disc still delivers and comes recommended.